Welcome to our sixth Summer of Service post! Each Monday in June and July, we're privileged to be featuring a fantastic guest blogger sharing his or her unique and personal perspective on service, volunteering and citizen philanthropy. Today, please welcome Jyl Pattee, the founder of Mom It Forward and the co-organizer of the evo’10 Conference. Jyl will be sharing her ideas how to use online tools to become more engaged within the community. Thanks Jyl! I grew up going from one service project to the next at our local church group, at my dad's community club, at my scho ol, and to places and functions that supported my mom's various causes. I learned at a young age what Polio was and service became equivalent in my young mind with eradicating it. I learned that bake sales could feed families and car washes bought uniforms. I discovered that fundraiser events were a lot of fun only after a lot of work, especially when I played the role of my mom's chief gopher! All of the service projects we participated in had one thing in common: we went outside of our home and worked! Fast forward to adulthood where the landscape of charity looks vastly different from that from my childhood. The internet has made giving easier and faster not to mention, convenient. Here are five simple ways you can take advantage of giving from the comforts of your own home. 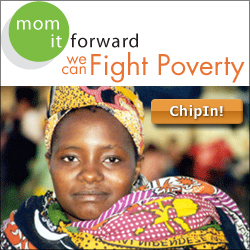 Micro donation/lending organizations like Choice Humanitarian, Kiva, and The Tipping Bucket have made donating to various causes on a regular basis not only possible because donations can be as low as $5, but also simple because all that is required is the click of a mouse and inputting a bit of informa t ion. Even the established non-profit organization the Make-A-Wish Foundation is applying principles of micro donating in its new symbolic giving program this summer: Summer of 5000 Wishes. To make a donation, just check a box for the symbolic item you'd like to purchase—items as low costing as sun screen and as costly as a flight. Then, check out the impact your donation made on the overall wish through a financial thermometer (see example on right). The internet has made information about issues easily accessible and readily available. In days past, we were reliant on newspapers, magazines, or research at the local library. Now, all you need to do is search for terms and a variety of articles, information, and sites pop up with both information as well as ways to help. For example, do you want to learn more about ways in which to help erase teacher-funded classrooms? Three non-profits come to mind spearheaded by these large companies: Bing, General Mills, and OfficeMax. Blogs have personalized causes for us by introducing us to the people who suffer from them. We've learned more and have championed causes like The March of Dimes because of people like Heather Spohr and the unfortunate death of her sweet daughter, Maddie. She has inspired us to raise not only awareness, but funds in her memory. We've supported each other through tough times, like when Anissa suffered a stroke, when Melissa's house flooded, and when Stellan was hanging on for dear life. And we rally for people who need our help, thoughts, and love on a daily basis like TammyStephanie. Through blogs, we've learned the power that comes from reading, sharing, and supporting—even from behind the computer screen. Service comes in many different forms and sometimes, a prayer, a kind comment on a blog post, a letter dropped in the mail, or supporting an online auction to benefit someone during rough times is exactly what is most needed. Twenty years ago, my brother was diagnosed with schizophrenia. I remember the process that diagnoses entailed. My mom spent hours and hours researching in the local library. My brother received diagnosis after mis-diagnosis. My mom didn't know of any other moms facing similar issues and had no one she could relate to. Learning to parent a mentally ill child was a long and lonely learning process. Not that all of those problems would be simplified in today's online world, but the power of online communities goes a long way in providing answers, support, and encouragement. Moms can talk openly about everything from autism and diabetes to home schooling and general parenting issues. The support is an act of service in and of itself that benefits both the giver and the receiver. Thanks to tools in social media, groups don’t have to travel to Africa to offer humanitarian aid. Social Networking Sites like Twitter and Facebook are another great way to share and receive information, raise awareness and funds, and connect with people who share your passions and with whom you can relate—and are no further than a step and a click away. In April of 2009, I ran a campaign, including online and offline events for Yehu Microfinance in support of women entrepreneurs in Kenya. In one month, and in partnership with the 12for12K organization, we raised $15,000 and got the word out in a huge way. People in 10 markets had the opportunity to attend events, but people all over the world had the luxury to interact from the comfort of their own homes with people in Kenya via a Twitter party and donate via a Chip In widget in as small as $2 amounts. Twitter and Facebook helped generate buzz and excitement and information and made all the difference in raising both awareness and funds. The next time you are wondering how you can better your community or make a difference in the world around you, stop! Get online. If you have time to go out into your community, research options to do so. If you don't, identify ways to serve online. Making a difference in the world is as simple as the click of a mouse! Start today! Jyl Johnson Pattee is the founder of Mom It Forward and the popular Girls’ Night Out (#gno) Twitter parties where women and brands connect weekly 140 characters at a time. She is also the co-organizer of the evo’10 Conference. Companies including Ann Taylor, Crayola, Famous Footwear, OfficeMax, and PBS Kids have engaged Jyl for her social media expertise and her ability to bring a brand into the online conversation in a fun, meaningful, and influential manner. Offline, Jyl is a mom to two boys; loves large amounts of cheese, dancing, and traveling; and lives in the beautiful Rocky Mountains.